Steak is one of those meats that we enjoy eating at least twice a week. If we could afford to eat it every day, we probably would! To keep things interesting around our house we are always looking for a new beef recipes to try out. If you want your steaks to be moist and flavorful...you will want to purchase the best cuts that you can afford. Cheaper is not best! Here is a great recipe for all of you to enjoy. Recipe and photo is courtesy of Friends Fun Wine. 1. Season steaks with salt and nutmeg. 2. On a grill pan coated with cooking spray, cook steaks over medium-high heat, turning once, until pink inside, 3 to 4 minutes per side. 3. Remove from heat and cover with foil. In a bowl, toss carrots, squash, pearl onions and sprouts in 1/2 tablespoon oil. 4. Over medium heat, in batches and turning once, cook until soft and seared, 6 minutes. 5. In a large pan over medium heat, heat remaining 1 1/2 tablespoons oil. Slice mushrooms; to pan, add mushrooms, white onion and garlic; cook until onion browns, 5 to 7 minutes. 6. Add Friends Fun Wine® Cabernet Coffee Espresso™ and simmer 3 to 5 minutes. 7. Add broth and bring to a boil. 8. Reduce heat and slowly add cornstarch mixture to broth mixture, stirring constantly, until sauce is thick enough to coat the back of a spoon. 9. Add fresh basil, salt and nutmeg; simmer 7 to 10 minutes. 10. 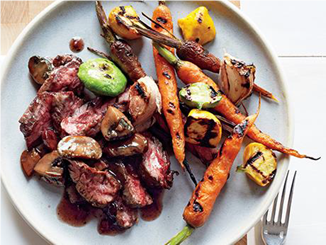 Slice steak, top with mushroom sauce; serve alongside vegetables. To Print Recipe: Click on the share button located at the bottom of this post. A new window will open. Then click on PRINT and the recipe will load into the window for printing.